The Paralympics have been a huge success for Great Britain, and not only within the sporting arenas. The public have been out in force to support the events while Team GB have responded with a record haul of 120 medals. But leaving the hosts aside, who are the big winners and losers in the London 2012 medal table? China have continued their dominance, which began at their own home games in Beijing four years ago. But the biggest disappointment has come from traditional powerhouse the United States, who slid down the Paralympics medal table despite regaining their number one status at the Olympics. Elsewhere, Russia, Ukraine and Australia have all produced healthy medal hauls to cheer their nations. Here, BBC Sport assesses the achievements of a number of countries and how their relative success or failure has been perceived at home. PERCEPTION: The London Paralympics has been met with a lot of enthusiasm in China. The country has around 82 million disabled people so there is a big audience. Chinese state media sent out a 100-strong team of journalists to cover the London Games. And it is clear from Chinese social media that many young people have been eager to find out about Team China's progress. HOW'S IT GONE? 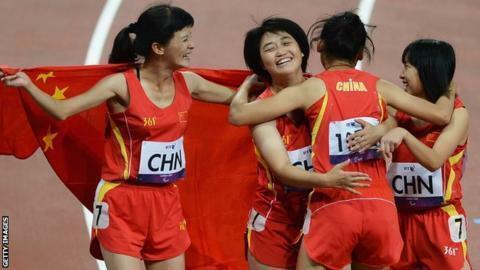 China has triumphed again at the Paralympics, after topping the medal tables in both Athens and Beijing. The country won the first gold medal of the London Games in rifle shooting and on Thursday celebrated its 300th Paralympic gold medal, won by Zhao Xu in the men's 100m-T46 final. Its team was smaller than in Beijing but highly successful across a range of sports nonetheless. TOP PERFORMING ATHLETE: China has so many Paralympic stars but one of the stand-out performances came from the youngest athlete in the team. Swimmer Yang Yang is only 15 years old but marked his Games debut by bagging four gold medals. He also broke the world record in the men's 50m backstroke S2 category. WHAT THEY SAID: Chinese coach Zhang Honggu (as quoted by Xinhua news agency): "China has developed fast in recent years and the government and people attach great importance to disabled people, which guarantees high-level systematic training for all the Paralympians. All our Paralympians train hard and they are eager to show their power in high-level competitions." PERCEPTION: The Paralympics have received scant attention in the US. The country was saturated with Olympic coverage last month, but amid the start of the American football season and the final few weeks of the baseball season, television viewers had other sport to watch. NBC, the official US broadcaster, did not air the opening ceremony and only showed about five-and-a-half hours of sport, none of it live. HOW'S IT GONE? The US finished sixth in the Paralympic medal count. If Americans were paying more attention, they might be disappointed to learn that rivals China won more than three times as many Paralympic gold medals. Most news coverage has focused not on results or the medal chase, but on human interest stories or curiosities, with headlines such as "Shark attack survivor wins bronze" - the tale about South African swimmer Achmat Hassiem. TOP PERFORMING ATHLETE: Swimmer Jessica Long, 20, won five gold medals, two silvers and a bronze. Long, who was born in Siberia and raised in Baltimore, was born without most of the bones in her feet. WHAT THEY SAID: Josh George, US wheelchair racer, in the New York Times: "Even more amazing than the fact that Londoners have opened their arms and hearts to the Paralympics is the fact that they are interested in us for our athletic ability, not the fact that we don't spend every day in our rooms crying about the fact that we can't walk, or are missing a limb or two." PERCEPTION: Even though the Russian team performed well, there was only brief coverage in the Russian media. But attitudes are changing, something that Russia's strong performance in London will help. The Paralympic Games are gradually becoming a source of national pride, and the government are playing their part in that. For instance, the government will pay substantial cash prizes which are equal to those won by successful Olympians. HOW'S IT GONE? Russia's performance was perhaps the biggest surprise of the Paralympics as the nation climbed to second in the medals table. This was a huge improvement from Beijing, when Russia finished eighth with 63 medals, 18 of which were gold. In London, the number of golds doubled to 36, while the overall medals tally climbed to 102. Most of those medals came in athletics and swimming. TOP PERFORMING ATHLETE: Without doubt, Russia's top Paralympian in London was Oxana Savchenko. The 21-year-old swimmer won gold in all five of her events, to add to the three she gained in Beijing four years ago. WHAT THEY SAID: Vladimir Lukin, the president of Russia's Paralympic committee: "Before the Paralympics, we didn't promise medals. After Beijing, we decided to try to get into the elite of the Paralympic sport - and we have done it." PERCEPTION: The Paralympics have received widespread coverage in Australian media, with multiple stories each day on the highs and lows of athletes' performances, and more than 100 hours of televised coverage. Considerable pride is being shown in Australia's Paralympic achievements and the way the country has invested in its sportsmen and women. HOW'S IT GONE? Australia surpassed its haul of 23 gold medals from Beijing with three days of competition remaining. It is something the Australian media was quick to highlight, and follows the country's strong showing at the last four Paralympic Games. The country's swimmers have shone, but gold medals have also come in sailing, cycling and on the track. TOP PERFORMING ATHLETE: Two names have stood out - Jacqueline Freney, the 20-year-old swimmer who has become Australia's most successful Paralympian at a single Games. She ended with eight gold medals in the pool. The other is Matthew Cowdrey, another swimmer who has become the first Australian man to win the same event - the 100m freestyle S9 - at three different Games. WHAT THEY SAID: Jacqueline Freney, after winning her seventh of her eight gold medals: "It is just unbelievable how good this meet has been." PERCEPTION: After Ukraine's incredible success in Beijing, the media started paying attention to the Paralympics but the level of coverage remains way below that enjoyed by the country's Olympians, even though they are less successful. Ukraine's main TV channel showed some of the action from London, though, mainly athletics and swimming, in which most of the country's medals came. Slowly but surely, Ukraine's Paralympians are becoming the pride of the nation. The government has recognised this, paying substantial cash prizes to medallists. HOW'S IT GONE? After causing a surprise by finishing fourth in the medals table in Beijing, Ukraine cemented its status as one of the strongest contenders in Paralympic sport. A tally of 32 golds in London comfortably surpassed the total of four years ago, and suggests there is a strong base on which to build for Rio. Ukraine's Paralympians proved far more successful in London than their Olympic counterparts, who won only six golds. TOP PERFORMING ATHLETE: At the age of 31, swimmer Nataliia Prologaieva made a fantastic Paralympic debut. She got four medals - three gold and one silver - dedicating all of her wins to her two sons, who were supporting her back home in Ukraine. WHAT THEY SAID: Swimmer Oleksii Fedyna, who won a gold and a bronze in London: "The Ukrainian team is a lot stronger, and their results keep getting better. The spectator support was very good. Thank you England - London has been the best Games." London 2012 saw swimmer turned cyclist Sarah Storey ride into the record books, equalling the 11 career gold medals won by Britain's top modern-day Paralympians Baroness Tanni-Grey Thompson and Dave Roberts. Sprinter Jonnie Peacock, aged 19, beat three-time Paralympic champion Oscar Pistorius to become the fastest amputee sprinter in the world. Peacock took the 100m T44 gold in a world-record time. Among a host of heroes, wheelchair athlete David Weir collected four golds - proving as adept in the 800m as in the marathon - while Ellie Simmonds was twice a Paralympic champion in the pool. Great Britain won a record 120 Paralympic medals in London, a rise from 102 in Beijing - although the number of golds fell from 42 to 34, and with it came a drop from second to third in the medals table. "The overall performance has been good, although I think the medal target was tough. "Great Britain won some unexpected medals, while some established athletes who were expected to win did not. "Tennis player Peter Norfolk and rower Tom Aggar did not do as well as they should have but equestrian pair Natasha Baker and Sophie Christiansen were both successful. "It was good to see the younger people come through. It makes me feel positive for Rio and beyond." "As a whole Great Britain have done pretty well, but there have been some disappointing performances. "There have been people who have come here and have not swum lifetime bests and I think if you come to a home Games and don't do that then that has to be a disappointment. "Whether it is because people have been unlucky with illness and injury or whether their focus and commitments have been elsewhere is difficult to say. "But I think there are at least four swimmers who did not deliver and could have made up the different between the gold medals won in Beijing and here in London."